Here's my clean and simple love themed design for the current My Favorite Things Wednesday Sketch Challenge. 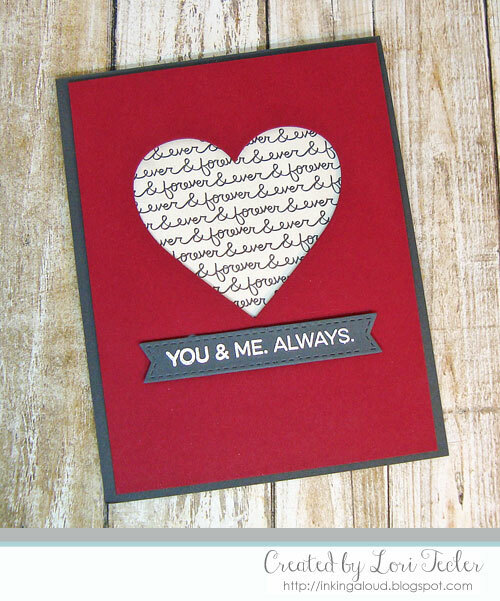 The design's focal point is an open heart shape backed with a piece of patterned paper with the words "forever and ever" repeated over and over. After cutting the heart out from the red cardstock panel using one of the Die-namics Pierced Heart STAX dies, I used foam tape to adhere the patterned panel behind it. The sentiment is from the More Essential Sentiments stamp set. It was stamped in white ink on a Steel Grey cardstock strip cut with one of the Stitched Sentiment Strips dies. To get the words to pop against the dark grey background, I embossed the text with white embossing powder. The strip was adhered just beneath the heart using more foam tape. The finished panel was adhered to a gray card base to match the sentiment strip.